Chinese and overseas carmakers are expanding cooperation through methods like mergers and acquisitions (M&As), and experts said on Sunday that domestic vehicle producers are aiming to cope with a fast-changing global industry. "The car industry is on the verge of big changes. Smaller, less professional producers are being marginalized. In the end, there might be only several big players surviving. 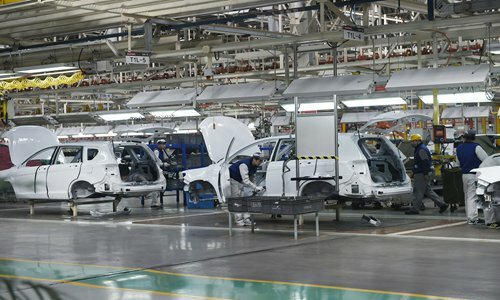 Domestic companies are doing whatever they can do to get ready for such competition," Jia Xinguang, an executive director at the China Automobile Dealers Association, told the Global Times on Sunday. Li Shufu, chairman of domestic carmaker Zhejiang Geely Holding Group, recently acquired a 9.69 percent stake in Daimler AG, the German maker of Mercedes-Benz cars and trucks, according to a statement Geely sent to the Global Times on Saturday. The move makes Li the largest shareholder of Daimler, the statement noted. In the statement, Li said that car industry players must "achieve and assert technological leadership" by adapting a new way of thinking in terms of sharing and combining strengths. In other examples of the trend, Hebei Province-based Great Wall Motor reached an agreement with BMW to cooperate through joint ventures, according to a statement Great Wall sent to the Global Times on Saturday. The companies will work together to develop new-energy cars and future technologies, the statement noted. Another domestic carmaker, BAIC Motor, recently sold 5.84 billion yuan ($922 million) of assets to Beijing Benz Automotive Co, according to media reports. Guangzhou-based GAC Motor in January outlined a plan to expand its operations in the US, with the company's executives saying that they plan to begin selling a vehicle in the US in 2019, possibly in partnership with Fiat Chrysler Automobiles, according to a report by the New York Times on Friday. Wu Shuocheng, a Shanghai-based independent analyst, said that the primary aim of domestic carmakers' M&As with overseas automakers was to get technologies that otherwise they would find it very difficult to develop on their own, particularly in the sector of electric cars. "Daimler also has technology reserves in new-energy cars. For instance, Mercedes-Benz has recently launched a sub-brand called EQ for its electric cars," Wu told the Global Times on Sunday. "Compared with other cooperation methods, such as setting up joint ventures, M&As are more effective in helping Chinese companies win cutting-edge technologies," Wu said. But Jia said that chances are declining that M&As between Chinese and overseas carmakers can be completed. "Japanese carmakers resist external M&As, and US companies are also becoming more and more cautious. Therefore chances like that involving Geely's M&A with Volvo will be very rare," he noted. Apart from M&As, joint ventures are another means of cooperation in the car sector, Jia said. He said that in the past, Chinese companies would import technologies through joint ventures, but nowadays these arrangements have become more equal and complementary. "Now Chinese companies also have things (like technologies) to offer," Jia said. "For example, Denza, the electric car brand that was jointly developed by Chinese carmaker BYD and Daimler, used BYD batteries," he noted. According to Jia, it's common these days for domestic and overseas carmakers to contribute technologies for a new brand. "For instance, in terms of automobile lightweight technologies, domestic carmakers still need to rely on overseas technologies to some extent," he said.